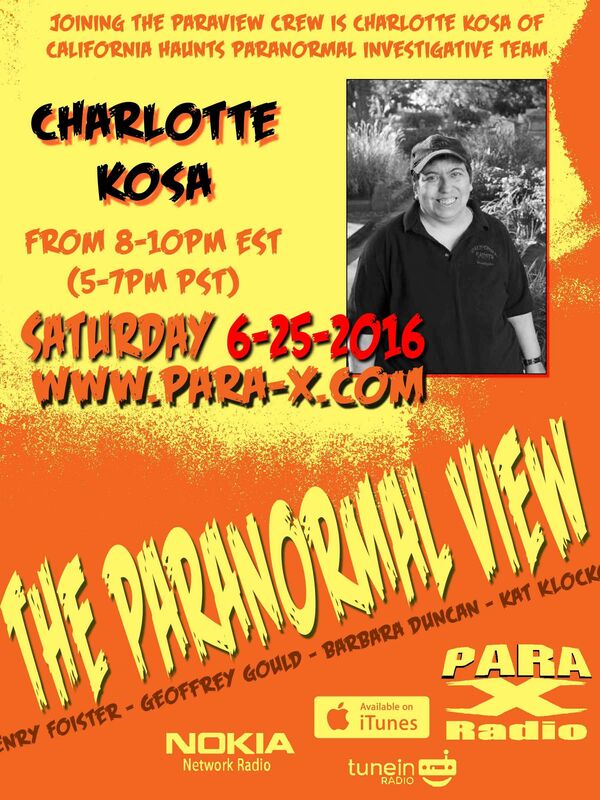 Tonight's guest was Charlotte Kosa of California Haunts. I was absent this edition, attending the Sunset Film Festival at which a project on which I'd worked was being awarded Best Pilot. While there I met Amy Goddard, creator of a new webseries in which she's stars, Another Day With You, also starring talented character actor Bob Clendenin who, at the event, was awarded an Achievement Award for his work in the industry. As my friend Mike Beardsley was in attendence, being a major role in the Zack Van Eyck project for which we were there, he and I had worked with Bob Clendenin on Dude, Where's My Car? sixteen years earlier, and I'd worked with him again on his 10 Items or Less TV series, as well as occasionally coming across him at various auditions. I had informed the Paranormal View Crew about my attending the film festival, and introducing the show, Henry said I was "off on some adventures." Kat spoke of her attending the week before her own adventure to Sandwich, Massachusettes on Cape Cod, going to the Oldest House, built in 1665, and a visit to the local cemetery founded in 1639. Henry spoke of his upcoming July 30th trip back to the David Stewart Farm in Gettysburg, and visiting (and possibly broadcasting from), Mr. G's Ice Cream; Kat will also be attending, and that former co-host Craig Rupp would be assisting in co-hosting that edition. Kat added July 16-17 she'd be attending Ocean ParaCon in Harrisburg, Rhode Island. July 14th he'd be invesigating the Preble County Historical Society again. Ceiling Cat Barbara Duncan introduced Charlotte, of the paranormal investigative team California Haunts up in Sacramento. She grew up around the paranormal; she grew up, and still lives in, a haunted house, with substantial activity. Disturbing of native american burial grounds, and the results thereof, was discussed. Charlotte spoke of how detailed is an investigation's pre-planning: a 101 quesionaire, base-lining EMFs, mapping out the house and its furnishings, et al, so should differences and/or distinctions show up, more investigations at such spots could be done. CC and Charlotte spoke about the wonderful Brookdale Lodge, and CC learned it is indeed re-opening. As she has a radio show as well, Charlotte and Kat spoke about unexpected live on-air EVPs. Giving a quick run down of awesome haunted spots to investigate, Charlotte listed the Hotel del Coronado and the Whaley House; up in Hollywood they have the older of the two	Wax Museum (Henry added that Marla Brooks had spoke of experiencing things in that one), the Moss Beach Distillery and the	Brookdale Lodge; the very active Woodland Opera House, the Sacramento Theater Company, the Sloughhouse Inn, the Murphys Hotel; (CC added the Jack London mansion ruins, and the USS Hornet she's investigated), several haunted hotels such as the St. George Hotel in Volcano... essentially it could take a month to get through everything. She remembered the Queen Mary at the last second, referring to Los Angeles as opposed to its Long Beach location, but "close enough," as it were. Kat mentioned my own loving the Queen Mary, and my having investigated there several times myself. Henry asked about the Castle Air Museum, and the haunted B-29 therein. After the second break CC (who Henry accidentally called Marla), reported tonight's show having listeners in the US, the UK, Canada, Costa Rica, Singapore, Australia, and Unknown. While talking about Sacremento and Old Sacremento spots, Henry learned somehow that while the show/call was still being recorded, it wasn't actually going out over the server/s, so the chat room was no longer hearing anything. Charlotte spoke of a persistant ghost during an investigation at a Columbia hotel, as well as her being Followed Home briefly afterward. They got so busy at one point they were doing one a week. They love going back to the Opera House, as after a while the ghosts Get Used to returning investigators. She spoke about the full body apparition photo on their site from there, taken when no one else had shown up yet. The Opera House is also on the official California Registry of recognized haunted places. Bursting to mind came the Empress Theater, which is very active. CC and Charlotte mused over other haunted spots such as the Clift Hotel and the Queen Anne (they were calling it the St. Anne, which isn't coming up). Also, up there on the bluff is the Presideo, though there has been Satanic Worship going on up there. Henry indicated his again forgetting who was Anton LaVey, much to Kat's surprise, as I would have had I been there. Henry asked about the Diamond Springs Hotel, which Charlotte reported as Very Active, what with footsteps, ghostly children giggling and laughing, et al. Charlotte provided her information (see below), and that she's got a book on which he's working coming out next year, plus they're working on a documentary regarding haunted hotels up and down the California coast. Kat gave out most of the show's How To Find Us information, though while giving out my Paranormal View Hub page link, she inadvertently omitted the .htm suffix for my geoffgould.net/2011pnv.htm page.